Home America Coulter the laughing hyenas. [dropcap]I[/dropcap] keep reading all these mainstream media articles written by reporters and “experts” who all presume to know what will now happen in a Trump presidency. But I don’t understand why they’re even printed. They’re written by people who simply couldn’t be more wrong about these things — demonstrably so. Why even keep them on staff? Why not fire them? I would. The media should try to retain some credibility. They won’t this way. Theses people uniformly dismissed a Donald Trump win — out of hand. They laughed at it. Sneered at it. Summarily abandoned or ignored even the possibility — first of him actually even entering the race, then under the Republican banner instead of Democrat, then winning that Republican race, then winning enough electoral college votes to win the presidency. “There’s no path to victory for Donald Trump” was the universal cry of all these geniuses — mostly with the sneering suffix “–Thank God” attached either literally or under their breath (as if these liberals suddenly revered God). They wholly misunderstood the entire American electorate. Got it all wrong. Completely. So now we’re supposed to listen to them as they pontificate about the future Trump presidency? You have to hand it to those who (yeah, like me), did not dismiss the possibility of a Trump presidency. Luckily, I only have to “hand it to” approximately 14 people aside from his earliest and bravest supporter, Ann Coulter (whose brilliant column I will never cease to mention was featured here for nine years). I was about to totally lay into one Globe & Mail op-ed writer until I researched and found he and his writing partner were actually early Trump-winning advocates. So I decided to go ahead and hand it to them, and get that out of the way before I more gently lay into them (which I did separately, here). Canadians and their government should nevertheless ready themselves for the possibility of a Trump presidency. That was May 16, 2016, well before the Republican primary was even won, in a Globe and Mail column titled, “Brace yourselves: Trump is going to win.” It was written by co-op/ed writers Derek H. Burney and Fen Osler Hampson. Note that the column was not supportive of a Trump win by any means. Quite the opposite. But still. I want to make special mention of Ann Coulter, and not just because her column appeared here for nine years (did I mention that?) and I’m among her biggest fans (and she of mine, in my wildest dreams). The best example of the wrong-headed smugness with which liberals generally and #neverTrump-ers — but more importantly, mainstream media “experts” — can behave, is captured in this video from June 2015. 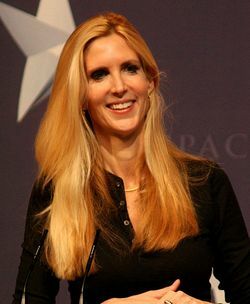 In it, left-wing host Bill Maher, all his other panelists, and his left-wing audience, all laughed like hyenas at Ann as she predicted that Trump would — remember this is June 2015 — win the November 2016 election and become president. That clip should be required watching for all mainstream media employees. All of them. And journalism students. A few Democrats would profit from it as well, and certainly all the hideously smug Canadians — Conservatives included — would benefit enormously.